I first wrote about the new Gummi Root Beer Barrels about two weeks ago and the folks at Haribo were kind enough to send me some samples to try. I only got five pieces and they weren’t even in real packaging yet. I really like the flavor of root beer, both in liquid (believe it or not, I’m drinking a Frostie Root Beer as I write this) and the classic Root Beer Barrel candy, so I was really excited to try these. 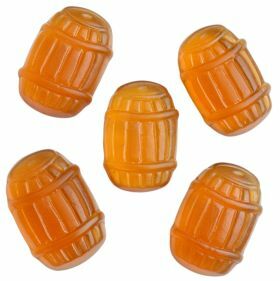 The gummi root beer barrels have a fun barrel shape, but are flat and are a good size – maybe twice as big as a standard gummi bear. I was hoping for a good strong root beer taste, but the root beer taste is overwhelmed by a lemony taste. To me, root beer has NO lemony taste, so that confused me a bit. I was really hoping for the root beer equivalent of Gummi Cola Bottles, but I was disapointed. Having said all of this though, they’re still pretty good, they’re just not “rootbeery” enough for my tastes. I would still recommend buying these if/when you see them in stores, just realize they don’t have the powerful root beer taste you might expect.